Keep up-to-date with all things bookkeeping. Is there something you would like us to cover? It's on the bank statement - why do you want the paperwork? Or... how we can save you time, grief and money! We often have clients ask us why we are particular about source documentation when undertaking work on their behalf, rather than just "taking their word for it", or "it's on the bank statement". Recently working with a new client who had a $12,000 withdrawal from the bank account. It was a deposit on a new motor vehicle, and they were expecting us to "record it and claim the GST". We insisted on seeing all the documentation relating to the purchase of the vehicle, including the loan documents. This enabled us to record the vehicle purchase transaction, and the loan transaction correctly, and to then reconcile any bank transactions that had occurred (mainly loan repayments). In stepping through this process, we identified that the $12,000 that was paid as a deposit, had not been offset against the value of the vehicle purchase price, and the full purchase price was subsequently financed. 1. The client had essentially over paid for the vehicle - our discovery has triggered the client to request a refund of the $12,000. 2. If we had processed based on the clients "word", we would have been overstating the value of GST credits that could be claimed by the client (>$1000). 3. If the file was reviewed by another bookkeeper or accountant, there would have been no justification for the expense that was made. 4. If the client had been audited by the ATO (and it's not uncommon for that to occur), this is likely to have been a transaction that would have flagged. What may have been a simple audit, may then have triggered a full audit, due to poor record keeping. So, the moral of the story is..... if your bookkeeper is asking you for source documentation, its not so they can ruin your day. It is because they understand how your accounting records should be compiled and have checks and balances in place to ensure that your records are as accurate as possible, and that you are never in a situation where somebody owes you $12,000! There are multiple ways we can get hold of your documents - from the old fashioned shoe box or paper bag dropped at our office, or the more sophisticated transmission using online services. If you want to find out how we can help you streamline your bookkeeping, take care of your paper mountain (yes... you can get rid of it! ), or know that somebody has your back, and is looking for that over payment (or sadly, sometimes under payment...), don't hesitate to contact us to find out more. We can recommend a solution that is the best fit for YOUR business. 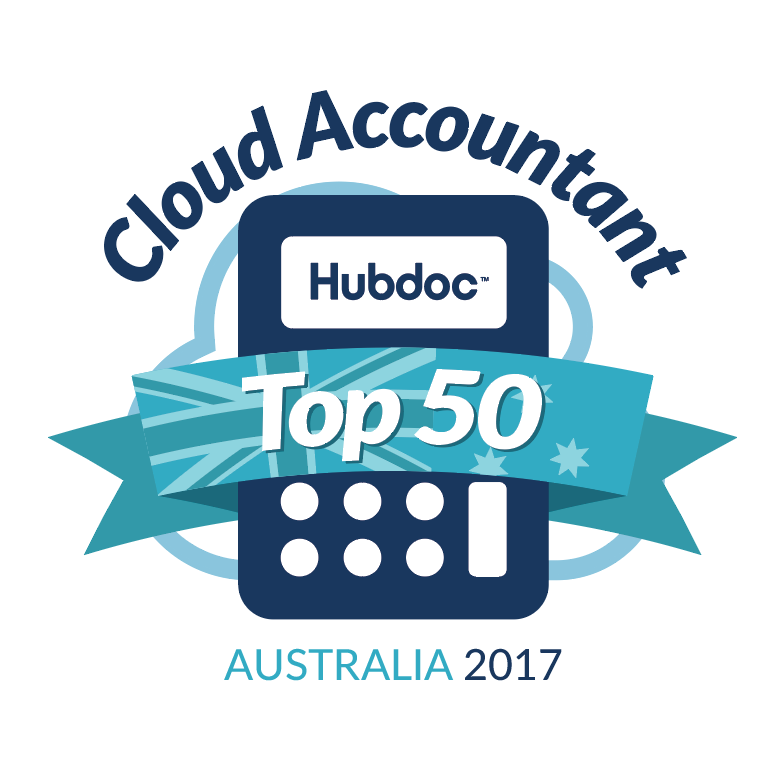 For the second year in a row, are privileged to be recognised by HubDoc, one of the industry leaders in the automation of financial documents, as a Top 50 Cloud Accountant for 2017. While we are a bookkeeping practice, not an accounting practice, to be considered in the same breath as other accounting and bookkeeping practices is humbling. Why were we recognised? We use the synergy that occurs by running ours, and our clients businesses in a cloud based environment, maximising the potential of information exchange, using tools to eliminate repetitive and time consuming tasks, to have access to real time information. Interested in finding out how we can assist you and your business leverage the power of cloud accounting? Don't hesitate to contact us for an obligation free chat about you and your business needs. Spam - it is the bane of any business, and can end up consuming much of our time as we try to out wit, out smart and out play the spammers. If it sounds like a game of Survivor, you're right, it can be - they can slowly wear you down! DID YOU KNOW....? Spam can be reported! Yep... that's right, there is a government agency that will take reports of spam, both SMS and email. Email Spam can be forwarded (unedited or appended in any way) to the Spam Intelligence Database at report@submit.spam.acma.gov.au. There are a few things to consider before making a complaint, either regarding SMS or Email Spam, and more information can be found HERE. Fair Work or not Fair Work... that is the question! We are regularly hearing stories of businesses that have been after HR and employment advice, and have done (or so they thought) the right thing in googling Fair Work, and going to the horses mouth for advice, only to find that they are being asked to pay for the "Fair Work" advice. Let's get one thing straight... right from the start... Fair Work DO NOT charge for advice - they are a government agency, and their sole responsibility is for the provision of information and advice about your workplace rights and obligations, both as an employer and an employee. Fair Work have a comprehensive website, which provides links, calculators and information regarding these entitlements and obligations. They also have means of contacting them, and if you do speak to somebody, they do not charge for their services. The Fair Work website is a federal government provided service. The website will always end in .gov.au. You are not required to register, and provide business information to access details on the Fair Work website. While you do have the choice to subscribe to email updates, you do not need to provide ANY information to access the resources that are available. Fair Work does not endorse any organisation for the provision of advice regarding Fair Work information. Any business that tells you that they have been "endorsed and accredited by Fair Work" is being deceptive. Government Agencies are business neutral - they do not, and cannot endorse private enterprises for the provision of information. They will not require you to arrange an appointment to have somebody visit you on site to assess your query. Fair Work will not redirect your call or query to external phone numbers or websites. They will however, provide you with the references to your query within the Fair Work website - always look for the .gov.au extension. Caveat Emptor (buyer beware). Take note of the above, and if you are ever using any search engine to search for information regarding employees, entitlements, wages, conditions or the such, ensure that the website you click through is the correct one. The stories we are hearing of businesses being duped by these impostors are heartbreaking - being coerced and forced to sign up to long term "support" contracts, at exorbitant costs, with substandard service and information being provided, with no cooling off or contract termination clauses. If you think you may have fallen victim to one of these businesses, then contact the ACCC as they are keen to hear more about these businesses and their deceptive practices. Fair Work Australia have released the official list of Public Holidays for each of the States for 2018. It is important to understand your staff entitlements on public holidays, what they are and are not paid for, specific shift loadings, or overtime penalties for working on these days, and even unpaid leave taken, where public holidays fall within the period of leave that has been taken. Not sure how this applies to you and your business? Contact us on 07 3879 2090 or via our contact form to see how we can assist. We are starting to see an increase in malicious emails being sent, under the guise of "Outstanding Invoices". At face value, these appear to be sent from legitimate accounting software providers including Xero, MYOB, QBO. These emails are nothing more than an attempt to get you to download malicious code so that hackers can get into your computers and computer networks, and screw up your day, by either stealing critical data (ie: banking logins, etc), locking your data (ie: crypto locker) or undertaking identity theft. The emails appear legitimate. They appear exactly the same as other emails you may receive from legitimate suppliers you have done business with. They are getting more sophisticated, and are using email marketing tools, which can start to mask some of the "sent from" addresses. Educate your staff to not open any emails that they are not expecting. Always pause that extra breath before clicking through a link in an email, particularly if it is not from a contact you would have been expecting it from, or is addressed in a very generic way. Never, never never click through any links requesting you to enter account numbers or passwords - banks and other institutions will never ask you to do this via email. One giveaway that it may not be legitimate, is if you receive the error message about "problems with how this message is displayed, and that Outlook as prevented automatic download of some pictures in this message"
If in doubt about the legitimacy, phone the vendor - don't call the number on the email, but Google their actual business details and use the contact details you find online - the business may not even realise that their name is being used in scam/malicious email campaigns. ​Here are some examples of emails we have recently seen that are malicious - we will continue to add images as we see more come through, so check back regularly. ** Note: It turns out that the email from @conkar.com.au is not in fact a scam - we keep receiving these, so dug further and finally (through a long and circuitous path) found out who the business was that it actually related to. Turns out we have been receiving emails from the company on behalf of a client that last used their business >5 years ago, and for some reason, our email address had been linked to their account. We spoke directly to the accounts department of the business, and suggested that if they were sending emails out of their accounting software, that they really need far clearer details about: 1) the correct name of the business and 2) contact details of the business. While we do not recommend calling the phone numbers included in emails that we may think could be spam, having that level of detail will at least allow you to search on line and validate the authenticity of the correspondence. I'm making a profit, but have no money in the bank - HELP!! It’s not uncommon. We hear it a lot. A client calls us and is in distress. They look at their business numbers, and can see they’re making a profit, but when it comes to paying wages and bills, it’s a struggle……. They’re making a profit, but there is no money in the bank. The Balance Sheet is one of the most important documents in your business (yes… even more important than your Profit and Loss Statement). Your Balance Sheet will tell you what is happening in your business from a cash and financial perspective, and help you understand where your dollars may be. TIP: If you don’t understand the language or terminology on your Balance Sheet, and it’s just a random mess of numbers, ASK your bookkeeper or accountant to explain it to you. If they are unwilling to do this, then consider changing service providers. Your Debtors Ledger may also be called Aged Debtors/Accounts Receivables/Trade Debtors. Irrespective of the name, they all represent the same thing - a summary of sales that you have made, where payment has not yet been received from your customers. If you are short of cash, this is often the fastest way to see dollars hit the bank account. Start chasing up those customers that haven’t paid you within your terms of trade. Look at the amounts that are outstanding the longest, or those with the highest value, and spend 30 minutes every morning calling the customers and asking for payment. TIP: Try and find out what the value of your Debtor Days is – this figure represents the average time it takes a customer to pay you. Compare that with your terms of trade – are your debtor days close to your terms of trade, or are they longer than your terms of trade? The shorter your debtor days, the more regularly money is hitting your bank account, increasing the availability of cash that can be utilised. Three terms that all basically mean the same thing – the owner or director of the business, is taking funds out of the business for personal use. Your business is not your own personal bank account, and best practice would recommend that you keep your business spending and your personal/private spending separate. If you work under a company or trust structure, consider drawing a regular wage, and resist the urge to grab that $50 here and $50 there just because “I have money in the bank”. If you operate as a Sole Trader or Partnership, work out what you need each week to live on, and draw just those amount of funds from the business, and transfer to a personal account. Review your Drawings or Loan Accounts, and see what the transactions are sitting in there. Is it a case that there have been business expenses coded to the account in error, or have you been dipping your fingers (and sometimes toes and whole body!) into the business bank account to fund your personal requirements? It’s amazing how quickly these small amounts can build up to larger amounts. You also need to be aware that if you are working under a Company structure, there can be tax consequences attached to any funds you have taken from the business for personal use. TIP: Work with your bookkeeper or accountant to identify what your weekly wage can/should be from the business, and start drawing funds in this manner, rather than irregularly and on and adhoc basis. The other advantage of these regular amounts, is you start to get a far clearer picture of your businesses profitability, and the ability for the business to pay you a living wage. If inventory is a component of your business, it needs regular review. If you are operating on a perpetual inventory method, the value of your inventory does not appear as an expense on your Profit and Loss Statement until the inventory is sold. You may have purchased a large amount of inventory (which must be or has been paid for), however until it is sold, or incorporated into the product or service that you provide, you will not be realising the revenue associated with it. TIP: Review your inventory on a regular basis. Do random stock takes. It is important to know that your inventory levels on hand, match the inventory you have recorded in your accounting system. If they don’t, and depending on the value, it can highlight many different things, from employee theft, to not invoicing for work that has been completed, to obsolete and out of date stock, to name a few. Your liabilities are often one of the most frequent reasons you are cash poor, without even realising it. Have you borrowed money to purchase assets? (we saw a lot of this at the end of the financial year, with many businesses being told that they “could [incorrectly] get a $20,000 tax deduction if they bought vehicles or equipment). If you are servicing many loans, these will impact on the cash available to you in the bank account. Depending on the reason for the loan, the respective expense may not be seen on the Profit and Loss Statement until end of financial year (when depreciation expense and interest on loans, are often recorded). Some of the most commonly ignored or mis-understood liabilities, are those associated with your employees and your ATO obligations. Let get this straight from the beginning – GST and Pay As You Go Withholding and Superannuation, are not your funds. They belong to either the employees, or the ATO, and they must be paid. Period…. Not negotiable. Get over it, and learn to see them as a fundamental element of being in business. Your Balance Sheet should clearly identify what is owed to the ATO or the Super Funds for both GST and Employee liabilities, and you should factor these in when making decisions on financial spending. TIP: Ensure these items are clearly identified on your Balance Sheet – If you can't see them, then ask why – they should be obvious and easy to quantify. A key suggestion is to use a “Provision Account” to quarantine ATO and Employee Liabilities funds until you are due to make payment to the ATO or the Super Funds. Essentially this is a bank account, where every time a pay run is processed, the value of the Super and the PAYGW is transferred to this bank account, and on a weekly basis (or more frequently if you want), funds are transferred to cover your GST liability. Your Creditors Ledger may also be called Aged Creditors/Accounts Payable/Trade Creditors. Again, irrespective of the name, they all represent the same thing - a summary of purchases that you have made, where payment has not yet made to your supplier. These amounts are due for payment, and should be reflected in your Creditors Ledger, based on the expected due date for payment by the supplier. Correct setup of your accounting software, and correct entry of these transactions, to ensure that the amounts and expected dates for payment are correctly reflected, will help you understand when you expect cash to be leaving your business. Reviewing the Creditors Ledger on a regular basis, should provide you with clarity on when your suppliers expect payment. Endeavour to work within your supplier’s terms of trade. If they are offering you 30-day payment terms, use them, rather than paying in 7 days. If payment terms are 7 days, and you think you can, negotiate longer payment terms, to free up short term cash requirements. Don’t hold your invoices awaiting payment in a pile on the desk until you are ready to pay them. Get them into your accounting system, ideally daily, so that you have clarity on who you owe, what you owe and when it needs to be paid by. ​TIP: Understand your Creditor Days. This is the average time it takes you to pay a supplier’s invoice. Compare the individual Creditor Days with the supplier’s terms of trade. If the creditor days for a supplier are significantly less than their terms of trade, consider not paying as quickly. Ideally, your Debtor Days should be less than your creditor days, meaning that funds are being received by the basis, more frequently than funds are being paid out by the business. If the reverse is observed, start to investigate the reasons behind it. What can you do to change the status quo? Talk to your bookkeeper or accountant about the best strategies to manage creditors in your business. Set a specific day of the week where you make payments to suppliers, rather than paying every day – become more efficient at how you work with the data that you have available to you, and maximise the trade terms that are available to you. So, you’re right, this isn’t part of the Balance Sheet, but is a great document to review in conjunction with the Balance Sheet. Quite simply, your Cash Summary outlines the movement of cash through your business. Opening balance of the bank account(s), money coming in, money going out, closing balance of the bank account(s). It presents the information, not just from a revenue and expense (operating) perspective, but also from an Asset, Liability and Equity (non-operating) perspective. At a glance, you can see where your cash is coming from, and where your cash is going. It’s particularly useful in identifying the non-operating movement of cash, particularly the Owners Drawings or Directors Loans, and your employment and ATO Liabilities, and the timing of these payments in your financial cycle. Hopefully the above points have provided some insight into what can affect the difference between profit, and cash, and you can start to implement some of the strategies in your business. If these are areas that you want to know more about, or that you need support in working through, we would love to work with you to provide clarity and direction on your numbers. It’s about empowering you as the business owner to take ownership of your numbers. Contact us on 07 3879 2090 or via our contact form to chat further. There has been an "interesting" article published within the last few days, identifying 8 things to look for when selecting a bookkeeper to collaborate with. The article is (apparently) addressed to accounting firms that are looking to develop a collaborative relationship with bookkeepers. The article has been edited since its original publication (there was a reference to a home based bookkeeper, in between working with your clients, taking kids to school, hanging out the washing, and watching Dr Phil - the original of the article can be found here), but the underlying message in the article has not changed - it implied that if you were the owner of a bookkeeping practice, earning less than $75,000 per year, working from home as a sole operator, not using cloud based accounting software, not across a wide variety of add-on applications, without a webpage, and using a mobile phone to run your business with, then you were not a bookkeeping practice that an accountant should collaborate with. Understandably, this has caused great consternation within the bookkeeping and (I'm pleased to say) accounting industry. I administer the Bookkeepers in Practice (Australia) Facebook group (800+ members), and also co-admin the Bookkeepers Revolution Facebook group and the Bookkeeper Revolution LinkedIn Group (10,000+ members combined), and the response by members of these groups, to the points made in the original article have been scathing. There is also irony, that recently, I facilitated a webinar with Chris Wheatley, principal of Scope Accounting on the topic of "Bookkeepers and Accountants - working together collaboratively", and the ongoing development of positive relationships between the bookkeeping and accounting industry is one that I am passionate about. As part of the discussion, we asked bookkeepers to respond to "what would be the one thing to say" about the relationship between bookkeepers and accountants. The responses are summarised below, but highlight many of the challenges that we already face, without the negativity espoused in the original article! ​The original article referenced has done nothing towards developing a positive relationship between bookkeepers and accountants, and some now feel that it has or will have a retrograde impact if left unanswered. So here it is - from a bookkeeper who has been operating their own practice for 10+ years, both as a sole operator and with staff, who has worked from commercial premises and home based offices, and who has worked collaboratively with accountants since entering the profession in the early 2000's..... 8 REAL things an accountant should look for when looking for a bookkeeper to collaborate with. Oh, and by the way, this article can be completely flipped, and could also be titled 8 REAL things a bookkeeper should look for when looking for an accountant to collaborate with. One - Are they a Registered BAS Agent? Is the bookkeeper a registered BAS Agent - if they hold this registration then you know that they have the education, experience and legal authority to work with your clients undertaking BAS Agent services. You can also be assured that your clients are protected by the safe harbour provisions of the legislation, and that the bookkeeper has Professional Indemnity insurance coverage in place, and is more than likely a member of a recognised professional association. In addition, you can also be assured that the bookkeeper is undergoing a cycle of continuous professional development, which is one of the requirements of maintaining the BAS Agent registration status. Respect the skills that the bookkeeper has as a Registered BAS Agent - they've earned it! Two - Do they understand the industries that you work with? Fairly self explanatory really - if you focus on a specific niche industry, does the bookkeeper that you choose to partner with have a deep understanding of the industry, and the issues around it. If working in retail or hospitality, are they aware of the nuances relating to superannuation guarantee thresholds and shift loading? Have they had exposure to complex inventory environments, and understand the different way stock may be accounted for? Bookkeepers can be exposed to many industries, at the grass roots level, and over the years have developed high levels of expertise in these industries. Respect it, and harness the value that they can provide to you and your clients. Three - Will they respect the existing relationship that you have with your clients? Nothing worse than introducing a client to a new bookkeeper and having them move the client to another accounting firm, or the bookkeeper telling your client that they have partnered with a Tax Agent, and can now facilitate the tax process themselves. There are legitimate reasons where this may be in the best interests of the client (and as a bookkeeper I have seen as much shoddy and overpriced work from accountants as I have from bookkeepers), but any relationship that is purely based on screwing over the other party, is not one worth pursuing. Four - Do they speak positively about relationships that they have with other accountants? Worth considering - we all have bad experiences with our industry peers, but if all you continue to hear is negativity about those relationships, then there may be deeper issues and considerations to factor into the decision to enter into a relationship. Five - Do they facilitate open and collaborative communication between you and your client? Will they be available for you to discuss the work that they have done for the client, so that you can easily understand it in the context of the clients business? Does the bookkeeper include you in communications that they have with the client on issues that may have tax or future planning implications? Often, the bookkeeper is the first to be aware of a situation that the client may find themselves in, or something that should be flagged to an accountant for further review and discussion with the client. Find a bookkeeper who is savvy enough to understand these issues, and open the channels of communication between both you and the client so that what may be a small issue now, does not become far more urgent or complex if left too long. Six - Do they respect the boundaries of the relationship and is it in the best interests of the client? Is the bookkeeper prepared to enter into a discussion with you about what you do for the client, and about what they do for the client, and put boundaries and protocols in place for dealing with the client, to ensure that there is no duplication of effort? The collaboration between bookkeeper and accountant, should by one of synergy, with the ultimate outcome being the provision of a services that is in the best interests of the client. Seven - Are they continuously learning and updating their skill base, and open to new opportunities and ways of thinking? Any good bookkeeper worth their salt, is involved in a continuous learning cycle, not just to meet CPD requirements, but to enhance their service offering to their clients, maintain industry expertise, and provide high quality services in the marketplace. They should be adaptable and flexible thinkers, and be prepared to engage in new learning opportunities. They should be keeping abreast of the changes in the industry and absorbing and adapting to the changes taking place, and they themselves should be open to collaborative opportunities. Eight - Do they drink wine? Ok... see I added this to a) find out who actually read this far, and b) well, if you haven't got the gist of what the basis is of a high quality collaboration between bookkeepers and accountants by now, I really don't know what more to say! Chris Wheatley, in our webinar, commented that he was starting to see a convergence of the bookkeeping and accounting industries, and that within 5-10 years, he felt that, aside from the registration for various types of compliance lodgement, that the industries would be running in parallel in terms of the skill sets and the relationships with clients. If this does happen, then the need for collaboration will become a thing of the past, and each party will be respected for the contribution and support that they can provide their clients. ​Bookkeepers come in many variations - not size or shape, but business structure and the way that they operate. There are sole traders, companies, partnerships, trusts. The principal may work alone in their practice, or may employ staff or subcontract out work, either locally or overseas. One of the key challenges that seems to face many owners of bookkeeping practices, is their inability to step away from the desk, for more than a few hours at a time. A recent article by MindHealthConnect, stated that "there is a tendency for work to have a negative impact on other areas of life" and "that certain groups are more affected than others by work-life interference". People in certain occupations, including managers, professionals and those in the mining industry. Women, parents, professionals - here it is, the holy trinity of what many a bookkeeper in practice looks like today. I often hear when bookkeepers are talking about the relationship they have with their clients "I feel like I'm their b*&$@%y mother [suffixed with a sob, sigh or a giggle]". Ah, that sense of caring and nurturing the extended family! There is often a perception when working with clients, that we are indispensable to them, and we are continuously faced with the challenge of taking time away from our business, to go on that long weekend, to deal with a sick family member, or take the 2 month overseas holiday to [insert your bucket list location here]. If we don't start to put ourselves at the front, the stress and burnout caused by poor work/life balance will have severe consequences on our own health, and the ongoing health of our businesses, relationships and families. It can be a challenge. It can be terrifying. It can be done! What do I mean by that statement? You are a business owner. You are in control of your business. You make the decisions. I'm assuming that your bank manager, accountant, mechanic, dentist, hairdresser or doctor doesn't seek approval from you or their client base, when they decide to take some time off. I'm also figuring that your clients don't [always] inform you that they are going away either (I know with some of mine, it's only when I see the transactions through the bank account that I'm aware of it). They schedule in the time. They buy the tickets. And then they [sometimes] inform their client base that they will be away. I'm certainly not advocating that you drop everything and rush out that door with your sunhat and bikini right now, but what I am saying, is that with forward planning and preparation, it will easily become a reality. Pretty self evident really - you need to plan your exit strategy. This can be a challenge because we all have a sense at times that the world wont go on without us. Newsflash, and a burst to the bubble - it does and it will. Get over it. Start having conversations with your clients in advance. Tell them that you will be heading away, and that this is how you will be managing the work you need to do in your absence - take control of the conversation. Planning starts even further back, by including statements in your Letters of Engagement (which of course, you all have), that indicate that you have other staff (even if you don't) or you may utilise subcontractors or third party services (even if you don't). I know that the Australian Bookkeepers Network has some great wording around this, and I assume that the other professional associations have similar resources available. This also meets some of the Code of Conduct requirements from the Tax Practitioners Board regarding confidentiality. You will find with most clients, they are not concerned that you will be going away, but are more concerned that there will be continuity of service. Allay those fears, talk to them about outcomes and solutions, and it becomes an easier exit. But I'm the only person in my business - I cant possibly leave! Develop a network of trusted peers and professionals that you are happy to work with. Be there for each other and start talking sooner rather than later about the strategies you will employ to provide coverage while you are away. I've provided this support to two separate bookkeeping practices, over the last 12 months. One was a sole trader, based interstate, that I had never met before, but who was a member of the Bookkeepers in Practice (Australia) Facebook group that I administer. The second was a well established practice in Brisbane, with 3 staff who needed BAS Agent support across end of financial year, while they were overseas for 4 weeks. The sole trader bookkeeper reached out, explaining that they were going away for two weeks, and had one particular client that needed routine support during that time. In this situation, the bookkeeper had communicated fully with the client about who I was, and the client was happy to sign a letter of engagement with me for the two week period. I had a formal agreement with the bookkeeper, that this was for two weeks only, and that I would have (nor want) any ongoing claim to the client. Based on trust, absolutely, but we spoke through these issues in our initial conversations so that we were both comfortable with the arrangements. The principal of the second practice also reached out almost 12 months in advance of when they would be away. We met, and discussed the methodologies that we both used to undertake the EOFY requirements (mainly around preparation of the Payment Summary Annual Reports), and agreed on a process for dealing with the work that was to come through. Again, we had open discussion about the relationship with the clients, and how we would communicate with staff. This year, I spent just over two weeks away from my office, and the principal of the second practice, was available to my staff if they needed support while I was away - quid pro quo. Having good systems and processes in place makes the transition to another person much easier to achieve. If you don't have them, then your desire to step away from the office can be a catalyst to their development. Speaking from experience, once you start to document and implement systems to support what you do, there are other benefits that start to flow on from it. One of the key ones I found was that as I started to employ staff, it was far easier to delegate the routine work to them, as I had the systems in place to support it. If you are a sole operator, and struggling with getting away from the desk, or overwhelmed by the volume of work, staffing is often a viable solution, but may be delayed because we don't know how to bring somebody new into the business. Systems... systems... systems.... need I say more! Whether you have staff, or you choose to get an external resource to support you during this time, the greatest benefit you will receive is if they are empowered to make decisions that would normally be left to you. If you are using an industry peer, then I'm assuming you would select them based on their skill, knowledge and professionalism. If a decision needs to be made while you are away about work for a client, give them the flexibility to make that decision (obviously within reason) - you selected them for a purpose. Additionally, give your staff the ability to make decisions (again within reason). If you've set your systems up, and have great protocols regarding communication and process, empowering your staff to make decisions within this framework will enable you to walk away with confidence. Don't just wait until you are gone to empower them, start doing it now, so that by the time you do need to step away, they and you have the confidence to operate without your micro-management. Unless you are heading to the remote highlands of Timbuktu, and the ability to get wireless is completely impossible, technology will be your friend. I'm not suggesting that you use the technology to do the work that you would normally be doing (that is not a holiday! ), but use it to stay in touch with your staff, or your nominated person. During my recent trip to Cambodia (who's internet speeds are far better than in Australia! ), I made a point of checking messages (not emails) from my staff once a day. All my emails had been forwarded to a central email account where staff could manage and deal with as required. Staff knew to only send me a message (we use Microsoft Teams) if it was something that absolutely needed my input or direction on (they had been empowered to make decisions already, and had an industry peer to contact if there was something curly). In the past 6 years or so, I've managed to travel to Dubai, Bali, Japan, Vanuatu and Cambodia. In the next few years, I've got other locations on my radar, and will not be letting work take away the opportunity for me to achieve those goals - isn't that why we work? To find the balance is important, and critical to our and our families ongoing health and well-being. ​If you have clients that get pissy with you that you are taking time for yourself and your family, it beg's the question as to whether you really need them as a client. It will be daunting the first time you do it. But hell, it will be worth it! is the Director and Senior Bookkeeper at Laurus. Sometimes, she has some interesting things to say.....!